Valente Law provides real estate attorney services to clients in and around Hudson, Ohio. Our main office is located at 77 Milford Dr., Suite 226, Hudson, OH 44236. And as a Hudson, OH real estate attorney and law firm, we regularly represent clients in the greater Cleveland, OH and Akron, OH areas. Real Estate legal engagements that we cover include negotiating and drafting real estate transaction documents. We also resolve real estate disputes and lawsuits, rental properties, development projects and much more. Check out our main real estate attorney page if you are looking for more information on our Hudson, OH real estate law firm. We handle real estate transactions for buyers and sellers. This may range from something simple, like a residential purchase or sale, to a complex commercial real estate development project. Additionally, we help a lot of for sale by owner sellers with the process. Depending on our client’s need, we can negotiate the terms of the deal, draft all the documents for the deal, and coordinate the closing. Real estate legal documents include deeds (quitclaim deeds, warranty deeds, survivorship deeds, etc. ), leases, assignments, purchase and sale agreements, promissory notes, mortgages, and many more. We can draft any of these documents for you. We handle real estate disputes for property owners and occupiers. Common real estate disputes include contract disputes, partition actions between co-owners, evictions, foreclosures, landlord tenant disputes and many more. Our real estate litigation attorney has experience dealing with all of these disputes and can help you get a fair resolution. The Hudson Chamber of Commerce can be a great resource if looking for commercial real estate. With over 22,000 residents and one of the highest average income per person in the state of Ohio, Hudson has a lot of real estate activity with which we can help. 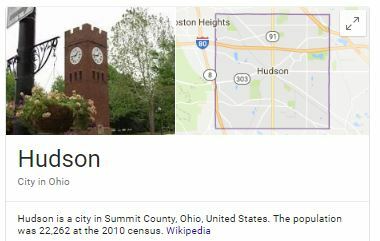 Hudson, is a city in Summit County, Ohio. Therefore, all legal documents pertaining to real estate in Hudson, Ohio should be filed with the Summit County Fiscal Office. Contact information for the Summit County Fiscal Office where real estate records are maintained is as follows. Additionally, other Hudson City officers should be found using the Hudson, OH City Government page here. Valente Law’s main office is in Hudson, Ohio and we are currently accepting new real estate law clients. Our Hudson office is located at 77 Milford Dr., Suite 226, Hudson, OH 44236. We enjoy working in Hudson, which is a great city to live in and do business in. You can find our office here! Please do not hesitate to contact us with any questions! We offer free consultations for most real estate engagements and always appreciate the opportunity to work with a new client. Call us today at (330) 665-5000!